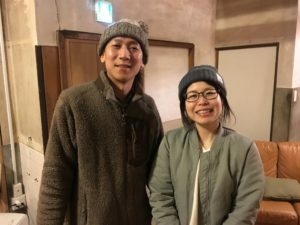 Takeshi, the owner of the Deer Park Inn, and Rei work to make their visitors feel at home in Nara Park. I must admit that when I first got to Nara that I was a bit disappointed. I really wanted to camp on the edge of the park and soon discovered that I wouldn’t be able to do so. But with every disappointment comes opportunity, and I discovered a great little hostel located inside Nara Park called Deer Park Inn. What makes this place so wonderful are the people who manage it, Takeshi and Rei. Takes is from Nara, and Rei is from Yoshino, a prefecture famous for its spring cherry blossoms. Takeshi is actually the owner of Deer Park Inn, but he works right alongside Rei and loves telling visitors about his home town. Takeshi said that when he travels he likes to get out into the natural world. Both Shinto shrines and Buddhist shrines are in Nara Park, along with a lot of deer. Deer are protected here and are considered sacred within Shintoism. In the video below, you will see a lot of deer because they are literally everywhere. You will also see a lot of families in Nara Park. The deer are quite tame and always looking to interact with people, especially people with food. I saw children of all ages playing and laughing with the deer. Frankly, I saw a lot of adults doing the same thing. The Kasuga Taisha and the Todaiji Temple are likely the most sacred places in the park. Todaiji Temple is the location of Daibutsuden, the Big Buddha Hall. The structure itself is massive, and the Great Buddha is just as impressive. 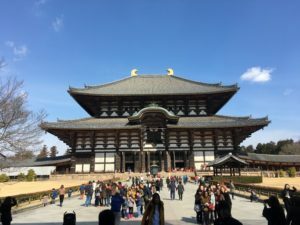 Todaiji Temple, the Eastern Great Temple of the Seven Great Temples in Japan, is location that draws tourists as well as a lot of devout Buddhists. When you purchase a ticket to enter Todaiji Temple, you can also purchase a ticket to enter the Todaiji Museum, which I did. It was interesting to hear some more about the history of the temple. Like most Buddhist shrines, this one was supported and spearheaded by an emperor, specifically Emperor Shomu. When I was in the museum building, I also saw that there was a lecture hall and that they were going to have a special event regarding the history of the art of the geisha in Japan. There was a short performance, which was really cool to see. A young geisha danced as three older women played shamisen and shakuhachi, the traditional musical instruments of geisha. One of the women sang. Then a woman provided a lecture. She even shared a number of videos in which older women who were trained as geisha in their youth explained their arts. I understood little to nothing of what was said, but it was fascinating to see these women (I would have to guess that they were in their sixties and seventies) performing and singing. So, I didn’t get to camp in Nara, but I did get to meet some amazing people and see some amazing things. When I leave for Kyoto tomorrow, it will be with a smile from the great day I’ve enjoyed here.